Toyota has always been pretty aggressive with its marketing for its hybrid cars. Here's another wonderful ad from them that promotes its hybrid tech. In fact, we think it is one of the most creative publicity stunts we have seen recently. 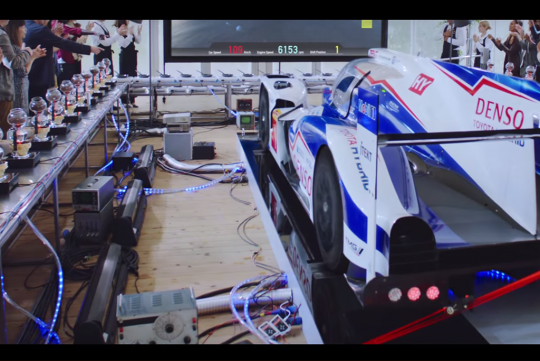 Using its LMP1 TS040 Hybrid race car, Toyota Gazoo Racing thought of an cool way to make known to people that the amount of electricity produced by its race car during a lap of the circuit in Le Mans can be quite substantial. It is so much that it can cook breakfast for quite a lot of people. 171 people to be exact and all the electricity needed can be gathered just via its brake energy recuperation systems. For those who don't watch Le Mans, the electrical energy stored in the race car's battery can then be used as an additional boost during overtaking during the race.